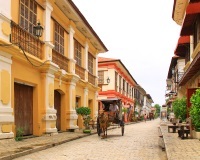 Established by the Spanish in the 16th century, Vigan is a charming town, full of gorgeous architecture and redolent of the Philippines' colonial history. Located about 250 miles (400km) from Manila on the island of Luzon, Vigan is said to be the best-preserved example of a planned Spanish colonial town in the whole of Asia - a distinction which has seen the town earn a place on UNESCO's list of World Heritage Sites. Full of cobblestone streets and buildings which fuse Spanish-Colonial architecture with Filipino and Oriental designs, Vigan is a fascinating and highly photogenic place. There is much to see and do in Vigan, including a visit to the hugely impressive Baroque-style St Paul's Cathedral, a ride in a horse-drawn carriage through the cobbled streets, and the opportunity to spend a night in one of the grand colonial houses built by wealthy Chinese traders in the city's 'Mestizo' district, some of which now double as hotels. Many of the streets are lined with shops selling trinkets, clothes and souvenirs and just strolling around is a pleasure. The best time to visit Vigan is in January, when the annual Fiesta celebrations bring parties, variety shows, beauty contests and a carnival-esque atmosphere to the streets.